Rita has been speaking at worship nights, summer camps, retreats, and parish missions since 2010. She blends personal testimony with scripture reflection and orthodox Catholic teaching to present a dynamic, authentic witness to the love of the Father and His desire for communion with us. In addition to the following topics, Rita is able to craft a talk that suits your event and audience. We all want to be seen - at the core of every song we hear and every movie we see, is the story of a heart longing to be seen, known, and loved. Drawing from the Gospel story of the Blind Man Bartimaeus (Mark 10:46-52), this talk explores the reality that, when we come to see the face of God, we see a loving Father who has seen us from the start. In our fast-paced culture, we can often settle for what makes us content in the moment, rather than wait and pursue the better thing that the Lord desires to give us. 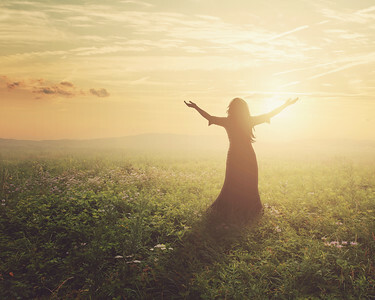 Using the story of the woman at the well (John 4:4-42), Rita explains the connection between our desires and our actions, and how we can journey deeper with the Lord as He reveals His greater gifts. Taking paragraph 221 of the Catechism of the Catholic Church, Rita uses the image of the Trinity as an "eternal exchange of love" to invite audiences to authentic service. Since "man cannot fully find himself except through a sincere gift of self" (Pope Paul VI), Rita shares practical ways to serve our families, communities, and churches with joyful hearts. In the course of just one day, we face countless opportunities to be a witness to the love and mercy of Jesus, but our brokenness can leave us feeling inadequate for such a task. This talk is an encouragement to let Jesus meet us in our messiness and make us new in the Holy Spirit, who empowers us to be powerful forces of love in an aching world. Insecurity, perfectionism, and comparison can be the most intense enemies of the human heart. In this talk, Rita shares the truth of our worth in the Father, shown by the sacrifice of His Son, and spoken to us constantly by the Holy Spirit.